Thanks to everyone who came and had a go at growing #DIYmushrooms on coffee grounds from Grindsmith’s coffee trike as part of The Allotment of the Future on St Ann’s Square in Manchester. Check out this film made for us by Helen Richmond to get a taste of the experience. We exhibited our mushroom growing lab alongside Real Food Wythenshaw, Sow the City and Soil, Plant and Geography researchers from the Universities of Salford and Manchester. The grand ambition was to give Manchester residents an opportunity to see some of the foods we might eat in the future and to explore the ways we might need to grow them in the city. Urbed, the architects, who co-designed the space, wrote about their approach here. 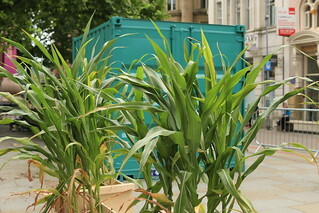 This great pop up experiment was part of the Manchester celebration of being The European City of Science. We had ~500 visitors mainly from Manchester and the North West but also visitors from Somali, USA, Spain, Australia, Italy and Denmark. Pink and yellow oyster mushrooms were grown on straw and shiitake on wood chip. During the week we harvested 8.8 kg of mushrooms – 2.4kg Pink Oyster, 5.6kg of yellow oyster and 0.8kg of shiitake mushrooms. The shiitake were quite late to fruit but that was fine as we gave some to local social enterprises, including 4Lunchmcr, who used them for cooking workshops. People shared their mushroom stories and memories on Instagram with us and gave us ideas as to where to take FarmLab next ranging from schools to social housing, to garden centres and festivals. Visitors to FarmLab packaged up 100 bags of #DIYmushrooms using up 50kg of Grindsmiths coffee grounds, some of which grew into Blue-Grey Oyster Mushrooms. 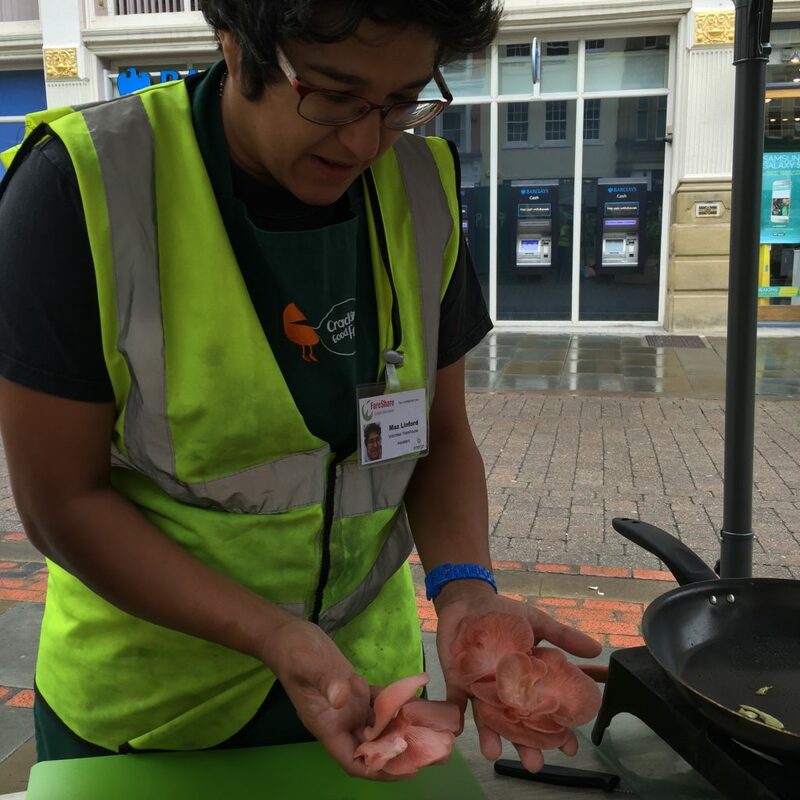 A highlight was Maz from Cracking Good food coming to cook the mushrooms – the lemon twist recipe was a personal favourite. Lots of people came back just to get a taster. A massive thank you to the super helpful and friendly Science City volunteers who were physicists, microbiologists, neuroscientists and retired engineers with a passion for engaging the public in science. Their enthusiasm for mushroom growing was perfect. Next stop Mushroom Hack at Manchester Science Festival.